Luxation of the patellar is a condition where the kneecap moves out of its correct position, causing the animal a great deal of pain. Dogs can often kick the patella back into place but, if not corrected, the condition can lead to lameness. Patellar Luxation is quite common. 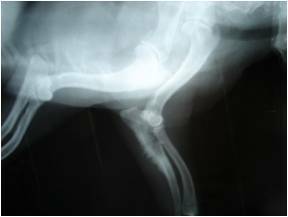 The condition can occur in any number of breeds however there are a number that are more susceptible to developing patellar luxation. Toy breeds are the most common sufferers of the condition, followed by a number of spaniel and terrier types. Luxation of the patellar occurs when the patellar ligament (which connects the patellar with the tibia) is forced too far inward and the patellar begins to shift incorrectly. After a number of months, the patellar’s housing can become so worn downthat it may begin moving out of its grove entirely. 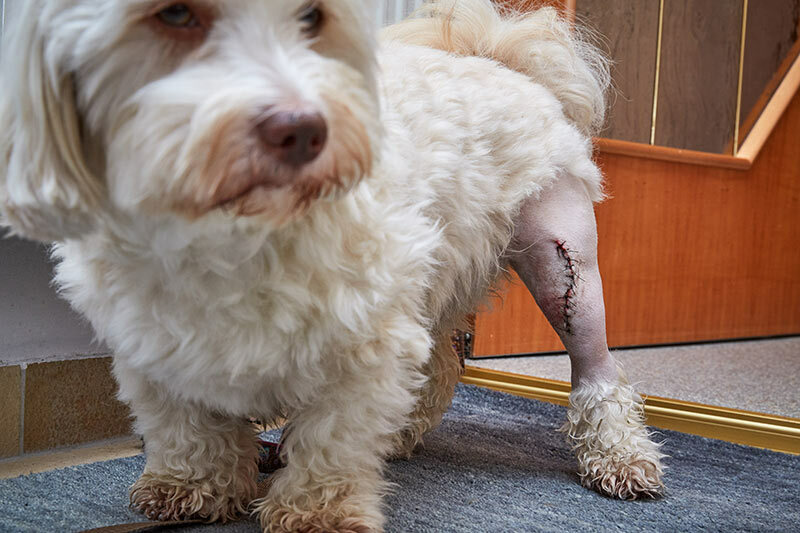 This will cause the animal a considerable amount of pain and, while the patellar can be kicked back into place, this doesn’t correct the condition of its housing, meaning the patellar can easily luxate again. 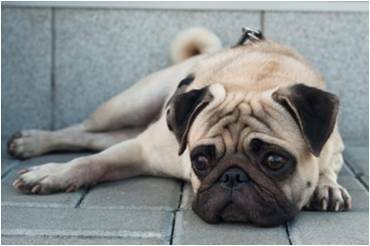 While many dogs with the condition will live happily for the rest of their lives, in some cases severe lameness can develop. There is a surgery called Medial Luxating Patellar Repair. During this procedure the surgeon will reattach the patellar ligament to its correct location. Also, the surgeon may deepen the patellar’s grooved housing to prevent further luxation. Patellar luxation is a difficult thing to prevent. The condition is largely caused by genetic malformation. Trauma is another cause of luxation of the patellar, however this cause is less common. The symptoms of patellar luxation will be quite obvious to the owner however the types of symptoms will depend on the severity of the condition. Your dog may become weaker in their movement. You may notice that the dog is getting up more slowly or will flop down to rest. Abnormal movement. When luxation occurs your dog will try to kick the patellar back into place. Often this will correct the luxation for a period. Unusual gate. You’ll notice your dog is walking strangely in the case of patellar luxation. If the dog’s gate is unbalanced, patellar luxation could be the cause. Loss of enthusiasm. If your dog usually jumps about but has stopped, this could be a sign of patellar luxation. They will usually develop an intolerance for exercise and appear lethargic. In severe cases lameness can occur. Sometimes lameness can come on quite suddenly and the symptom is unmistakable. Some of these symptoms are not unique to sufferers of patellar luxation. If your dog is showing intolerance for exercise and having difficulty rising, there are a number of possible reasons. When in doubt, consult your veterinarian for an accurate diagnosis. If patellar luxation is suspected, your vet will conduct a thorough physical examination of your dog. If your dog is one of the breeds most susceptible to luxation of the patellar, diagnosis may be made without further testing. In the case of further testing, your vet may conduct craniocaudal and mediolateral x-rays. These will target the hip and stifle joint. A skyline x-ray may be done to assess the state of the patellar’s housing groove. A fluid sample taken from the joint may also point to patellar luxation. The synovial fluid that lubricates the joint may have an increase in mononuclear cells. In severe cases of patellar luxation surgery is conducted. This procedure is aimed at reattaching the patellar ligament to its correct position with some tightening so as to avoid future luxation. Also, the surgeon may deepen the patellar’s grooved housing to prevent further luxation. While many dogs will live comfortable lives with some form of patellar luxation, surgery is required to correct the most severe cases. 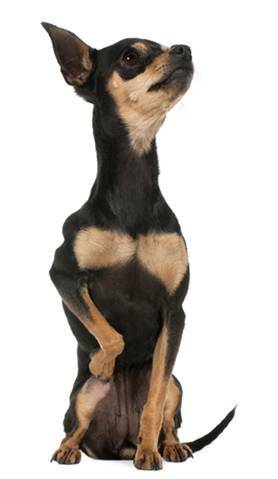 Toy breeds of dog are the most commonly affected, followed by a number of terriers and spaniels. The following list covers some of the most susceptible to developing patellar luxation. King Charles Spaniel, Cavalier King Charles Spaniel, English Springer Spaniel, Papillon, all Poodle types, Pomeranian, Pug, Yorkshire Terrier, Shar Pei, Maltese, Lhasa Apso, Chihuahua, Basset Hound, American Cocker Spaniel, Griffon Bruxellois, Dandie Dinmont Terrier, Affenpinscher, Australian Silky Terrier, Bichon Frise, Border Terrier and Boston Terrier. One of the best ways to prevent the luxation of the patellar from becoming worse is to exercise your dog religiously. Although it may sound like exercise will cause further wear and a higher chance of luxation, a healthy and toned animal at its correct weight is less likely to develop luxation of the patellar. Feeding your dog a specific diet may help to keep their joints healthy. There are now a number of dog foods out there that are specially formulated to maximise your dog’s rate of joint rehabilitation. Surgery is required in the most severe cases of patellar luxation. Even if your dog has a mild case, the condition is degenerative which means it’s likely your dog will require corrective surgery at some point in its life. Luxation of the patellar is a painful condition however your dog will only feel pain at the time the patellar leaves its housing. Once the patellar is free of its housing groove your dog may experience severe weakness but it’s unlikely they’re experiencing any pain.